There is strong indications that the Whittier City Council, at its April 26 City Council meeting, violated Brown Act Open Meeting Laws by discussing an interim contract in closed session between two trash haulers, Athens and Republic, then discussing a settlement of that contract at the open meeting, virtually eliminating Whittier resident’s right to participate in the decision. The Council will make a decision on the contract/settlement agreement at tonight’s meeting. Athens was awarded the lucrative trash contract months ago even after HMG-CN exclusively reported that the City’s consultant manipulated revenue numbers. That HMG-CN article spurred a citywide referendum that was certified by the County elections officials on March 23, 2016. The referendum, by State law, prevents Whittier from contracting with Athens for one year in any capacity, including an interim agreement. In defiance of the referendum, the council attempted to contract with Athens in early March, only to be rebuked. Faced with that fact, and a looming July 1 deadline, Mayor pro tem Bob Henderson openly admitted Council could not contract with Athens by sending out “urgent interim proposal requests” April 21 to CR&R and Burrtec, setting an unusual deadline of Monday May 2 at 8:30 in the morning. The following Tuesday at the April 26 meeting, using that threat of litigation, Council recessed into closed session to discuss a contract/settlement agreement between Athens and Republic. As reported by several councilmembers upon their return to open session, during the closed session, Council determined that Athens and Republic already had “collaborated” to combine services to the city. Council then decided that the two companies could be “assisted” by the City to complete the agreement, blatantly, and some say arrogantly, ignoring the relevant and applicable laws preventing the City from contracting with Athens. Immediately after that, Council indicated that the urgent interim proposals from CR&R and Burrtec were “no longer needed” and negotiations with those firms were suspended immediately. Reviewing the video of the meeting, and subsequent discussion, shows that the City and Council could be in for an expensive legal battle over the trash contract’s award. The council openly discussed a “settlement” that Athens and Republic would “divide the city” in a 50-50 split of services with Athens providing an infusion of cash similar to what CR&R offered months ago in their proposal. In addition, Athens would “purchase or lease” the City’s trash collection assets, essentially giving Athens the hauler agreement after one year. In directing the manner in which the two companies split the city, Council and the City were attempting to avoid what is obviously collusion and restraint of trade between Athens and Republic. The city is also attempting to circumvent the referendum by only giving Athens a part of the city, but there is ample case law to refute that action. Despite indemnification, the City’s approach will not work. Whether or not Republic agrees with the deal, or is a party to the settlement is moot. 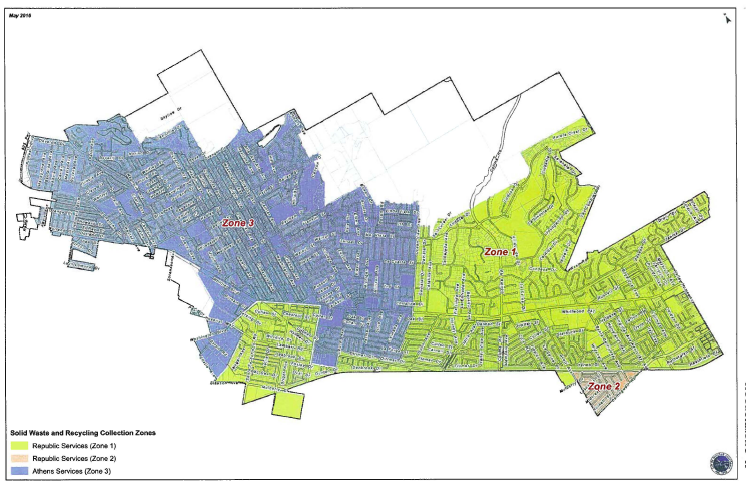 The prohibition, due to the referendum, on a trash collection agreement with Athens remains in place. The Council will also have difficulty with its arrangement for “splitting the City” and trying to avoid the restrictions on contracting immediately with Athens. Contracting with Athens for solid waste services without an ordinance is prohibited by the referendum. 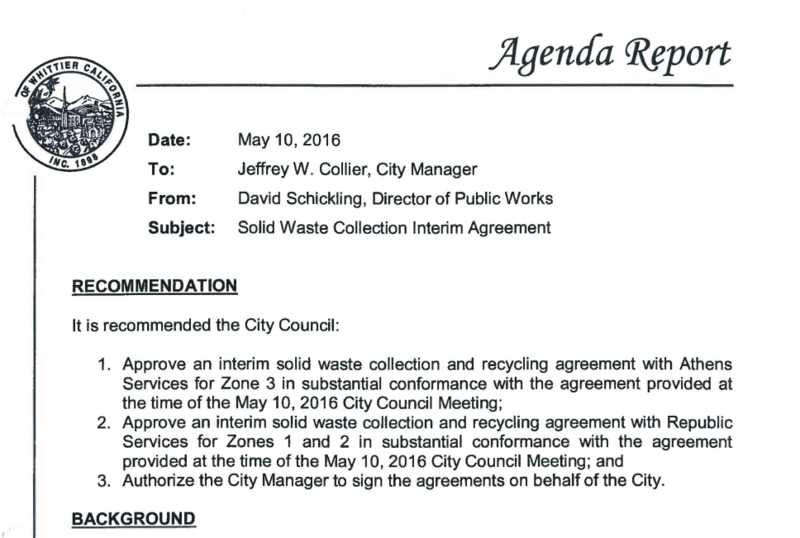 Despite the various prohibitions and legal ramifications, Staff Report 10-A, released by Whittier for tonight’s meeting, recommends the City Council approve the agreement and split city trash services between Athens and Republic. The referendum is not cited in Staff Report 10-A. Part of the staff report recommending approval of the contract with Athens and Republic. See Staff report click here. In Staff Report 10-B, Council is given the choice to repeal the ordinance that granted Athens the waste contract earlier this year or hold an election that will cost hundreds of thousands in fees. The Whittier City Council will make a decision tonight, either way it will not be good for Whittier taxpayers. Map of zones, negotiated by the City between Athens and Republic. The negotiations with Athens is strictly prohibited by the referendum. The trash in Whittier stinks because former Councilman Greg Norback is involved. The former t-shirt printer is now stinking rich as a result of his trash consulting gig. Naturally because he’s a republican that pathetic drunk District Attorney Steve Cooley didn’t prosecute Norback for serving as Whittier’s representative at LA County Sanitation while working for a trash vendor. BIG CONFLICT but not for a republican. I’m not surprises Whittier finally showed it’s corrupt side. They were just good at hiding it. But let’s not forget that Whittier’s the home of Bob ‘the Molester” Apodaca from Central Basin Water. Is this the agenda for the April 26 meeting you refer to in PP 1? where’s the DA on this? West Div. can you show any evidence to support your propaganda? West Div…interesting it was for me to find out the “Cerritos Street Sweepers” is actually Athens Services. I see where your interests lie.